While not the most common shoulder sports injury, a rotator cuff tear can be a very limiting. With causes ranging from overuse to traumatic injury, you can tear your rotator cuff in many different sports and activities. Overhead throwing activities are the most common sports associated with rotator cuff injury, however, tennis, football, swimming, and other upper body activities can also contribute. Understanding how your rotator cuff injury occurs, common causes, appropriate treatments, and prevention can all help to keep you off the sidelines. Your rotator cuff is a group of four muscles surrounding the shoulder. They all attach along the head of the humerus, and their primary role is to help stabilize your shoulder during active movements. 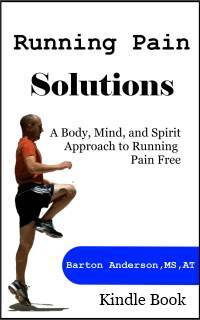 All four muscles must work together, contracting and relaxing in syncronization in order to produce a stable shoulder. The four rotator cuff muscles include the subscapularis, supraspinatus, infraspinatus, and teres minor. 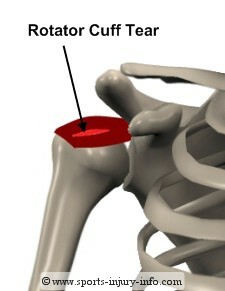 It is a disruption of the rotator cuff tendons, usually around their attachments on the humerus. The most common cuff muscle involved is the supraspinatus, followed by the infraspinatus. Tears can range in size from several millimeters to 1-3 centimeters. They can also be classified as either full thickness or partial thickness tears. This refers to how deep the tear is, and whether it goes all the way through your tendon from top to bottom. The most common cause of rotator cuff tears are repetitive overhead activities. The repetitive nature of overhead throwing can often cause problems with the rotator cuff. Many who suffer a rotator cuff injury have had previous shoulder injury, and may have suffered from shoulder impingement syndrome symptoms. 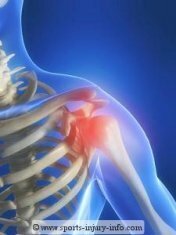 The repetitive stresses placed on the shoulder cause a gradual tearing of the rotator cuff, which worsens with activity. Overuse tears may take several years to cause pain and discomfort. Traumatic injury can also cause a tear of your rotator cuff. Falling on an outstretched arm can place significant stress on the soft tissue of your shoulder, and may lead to a torn rotator cuff. 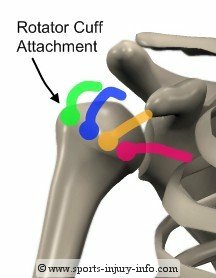 Structural anatomy can also contribute to the prevelance of rotator cuff injury. If you have a large or hooked acromion, you may be more susceptible to rotator cuff injury. An atraumatic rotator cuff injury has a gradual onset of pain and problems in your shoulder. It may begin as an achey feeling after activities, especially overhead activities. You may feel week, have a "dead arm", and movement of your arm above your shoulder may increase your pain. You may also have pain at night, especially when laying on the sore shoulder. A traumatic tear of the rotator cuff is caused by a specific injury, like falling on your arm, or throwing overhead. Traumatic tears are associated with immediate pain, feeling weakness in your shoulder when trying to lift your arm, and tenderness to the touch around the outside of your shoulder. Moving your arm above your shoulder will also increase your pain. If you have a torn rotator cuff, the first line of treatment is to rest your arm, and to use ice. Pain, weakness, and loss of motion all warrant a visit to your family doctor or athletic trainer. Your physician or athletic trainer will perform an examination to determine if you have a rotator cuff tear. Depending on the results of the exam, other tests like an X-ray and MRI may be used. An MRI can be very helpful in determining how bad your injury is, and will help determine treatment options. Your torn rotator cuff may be treated conservatively through rest and rehabilitation. Stopping the activities that cause pain, and working on improving pain free ranges of motion and strengthening of the shoulder are the primary goals for rehab. If you are suffering from nagging shoulder pain, you may be on your way to a rotator cuff tear. I see patients in my clinic who ignore their pain, or think that it will just go away, and six months later they are seeing me for rehab after surgery. A simple set of exercises designed specifically to strengthen the rotator cuff is all they needed to avoid injury and ultimately surgery. Had they sought treatment earlier, or been given a little direction, they could have saved a lot of time, pain, and money. As a practicing clinician, I believe in providing the highest quality of care for my patients. I also know that many people do not want to go to a clinic or their doctor for treatment. Thats why they wait so long before finally coming in...and then it is too late. While I highly recommend seeing your doctor for any of the above symptoms, there are other options. "The Ultimate Rotator Cuff Training Guide" could be the answer you are looking for. Prevention of a torn rotator cuff centers around proper strengthening and balance of the shoulder musculature. Limiting overhead activities to those that are pain free, and gradually increasing activities at the start of the season are also important. Flexibility, strength, and endurance of the shoulder can all help to prevent rotator cuff tears. A good training program that focuses on these areas could help you avoid surgery and continued pain. Rotator cuff tears are not the most common shoulder sports injury, however, they can be very limiting. A good shoulder and upper back strengthening program, along with proper warm up and stretching can help to prevent rotator cuff injury. Limiting your overhead activities to those that are pain free, and seeking medical attention with any type of shoulder pain or impingement type symptoms is recommended. Treatment of rotator cuff tears is often successful with rehabilitation and rest, however, rotator cuff surgery may be necessary.